Greetings my friends, Alrighty, Lets talk zombies. Now I know that we have passed the zombie book in Neo-Earth but this is pop culture blog day thingy so. 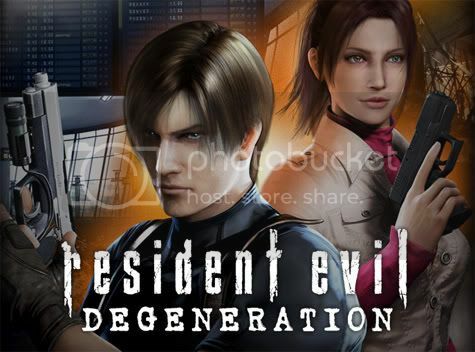 Resident Evil Degeneration. The animated movie has been released to the net and I am here to tell you it rocks on high. It plays off our common fear of terrorism and follows the events after Raccoon city. Leon is the man and I can not stress that enough. My loving wife was on night shift when I watched it and I have to say it was more than a little unnerving. My big chicken of a dog was with me so that helped a little. I have had reoccurring nightmares since I was a little child about zombies but for some reason I continue to watch them. I remember seeing the Mummy returns, that is the black and white one. Halfway threw the movie the mummy grabs a young woman in a tent and at that moment I am hosted off the ground and shook like a rag doll by my father whom had snuck up on me. It was one of the top 5 scariest moments of my life. I don’t know why zombies do it for me, maybe its something about your neighbors coming to eat you. It’s time for me to get to bed. I hope you enjoy Alice’s comic this week its crazy cool and we should be back on track with NENW after the holidays. Jessica showed me page 3 of the revamp and it’s looking great. Until next time keep the doors locked and the undead at bay!!! p.s. I won’t give you a link too the movie but it’s on Zulu. Enjoy and buy it when it’s released to support Capcom. Greetings and salutations. I’d like to talk briefly about today’s page, it opens up Neo-Earth to a much broader fantasy spectrum. Until now NE has had a medieval feel but the truth of the matter is that it’s in the future. The Ma’at counsel that is mentioned is inspired by the Egyptian God of balance, truth, and justice. The Ma’at counsel is set up to keep magical use and technology separate on earth. The reason that earth doesn’t have magic at our point in time is that in the past it was abused and simple decided to leave earth. When it returned you could imagine the craziness. Actually you can read about it in NENW. I have a link to more info on Ma’at for your reading pleasure here. Star Trek, the next casting. Also look forward to some artwork by the end of the day from the fabulous Alice Wise. She is just as talented an artist as a martial artist so look out!!! Next week we will discus the other aquatic nasty that have shown up in book 4. Thursdays update will be about Star Trek, where it's going and where it's been. I should warn you though I am a much bigger fan of Star Wars. In the meantime make sure that you click on the WCL pic below and vote for us. I have a delightful 3d rendering of a Neo-Earth Golem to show you for your efforts. I'm trying to make the top 10 this month so a vote daily would be much appreciated. Also I will update the 3D pic once a week. Greetings my friends, I am taking this thanksgiveing brake to catch up on blogs and promotions. I realize that introducing technology into Neo-Earth seems like a big risk but to be honest it's been part of the world from creation so bear with me and have faith that it makes seance in the long run. Starting next Monday expect blog updates on Tuesdays and Wednesdays. Tuesdays will be related to the comics and Wednesdays to fandom in general. Also I would like to say that Jessica's revamp of her comic looks amazing and we will start posting the new stuff shortly.